Writing food reviews is one of the highlights of my job, but a gin bar? I was more than slightly worried, having never been a gin drinker. Honesty is the best policy, so I was upfront with Lord Trevor Davis who opened his Tin of Sardines in partnership with his son Ben, at the end of last year near Poole Quay. He kindly said, “Reserve judgment until after your visit,” adding that the whole experience could woo me. On the plus side, I didn’t want to turn down the chance to visit what is set to become the gin capital of the new ‘city by the sea’ when Poole, Bournemouth and Christchurch councils merge in April. And my husband, Nick, was keen. Especially after I mistakenly thought he didn’t like gin and put a social media alert for a review buddy to join me. He soon put me straight and we set off to Poole Quay, having made an arrangement to sleep on board our boat in the nearby marina because it was only a short walk from Tin of Sardines. This was because we suspected we would be over the drink drive limit by the end of the evening. We instantly felt at home when we entered the bar and it was nothing to do with the gin. Tin of Sardines is fitted out like the back of a motor yacht. There is even a super-size photo on the wall of the view across Poole Harbour that you would see if the wall wasn’t there. The seats are nautical, as are the coat hooks and if you use the ‘head’ at the right time, you even get the shipping forecast. There can’t be many yachties around that won’t make Tin of Sardines in the High Street their first port of call when visiting Poole, and booking is easy on ship to shore or mobile phone. Once aboard the “gin palace” we were faced with over 300 gins, 40 mixers and a collection of botanical ingredients, all neatly arranged, yet dizzying at the same time. Where to start? There’s an extravagant gin menu, created, tried and tested by Trevor and Ben, or you could pick the ingredients for your own cocktail. A shot of your favourite gin, a mixer to complement the flavour, garnish and lots of ice is the way to go. 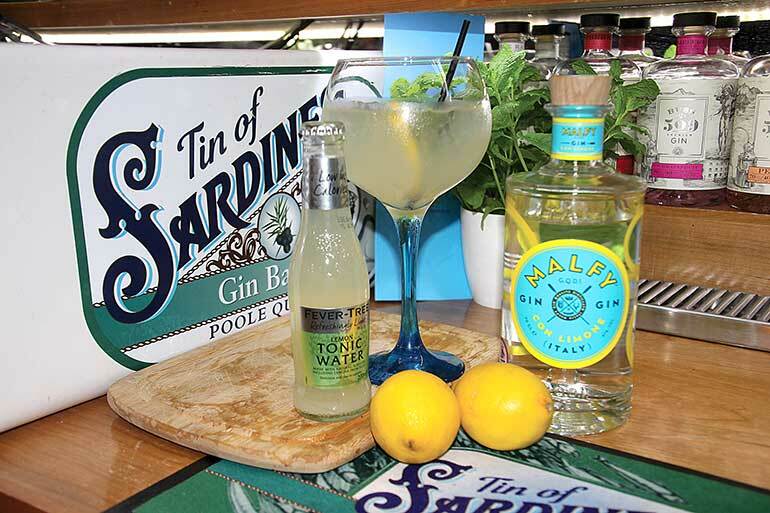 Our first was Italian Malfy Gin with Fever-Tree Lemon Tonic served by ginologist Stuart Gardener, who usually works at Tin of Sardines in Durham – another of Ben and Trevor’s establishments. Also in Durham, they have The Court Inn and Old Tom and if you’ve heard of an outside catering company called the Cheese and Pickle Company, that’s Trevor’s too. Born in Sandbanks, Lord Trevor is a character who has led a colourful life, and whilst sipping gin, we learned about his globetrotting and the entire history of ‘Mother’s Ruin’, as gin was known in the 18th century. 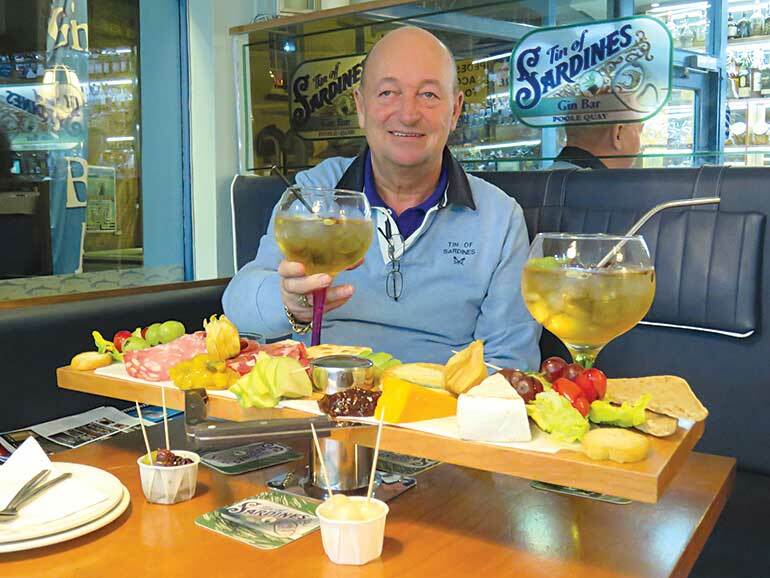 Having been a chef for 15 years to the rich and famous, Trevor has many a tale to tell, discretely, of course and it’s clear to see how he became a gin aficionado. He takes pride in his relationship with distilleries throughout the UK and worldwide, and offers customers some sought-after brands. 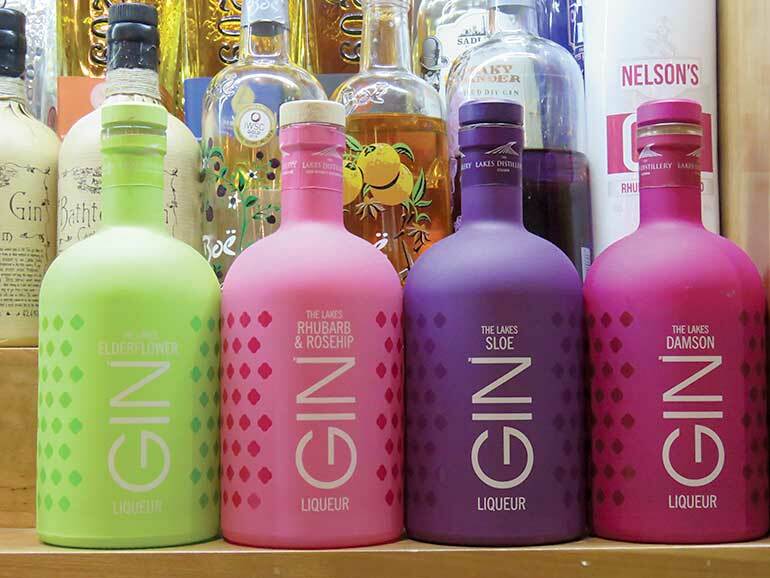 He is a practised gin hunter and offers Lilliput Gin, Jingle 999.9 and the famous cult gin, Monkey 47 among the brands. Laura Addicott brought us some nibbles to go with the Malfy, which I had to admit, was light with delicious citrusy notes that were wonderfully refreshing in the mouth. The classic juniper hit was less obtrusive, which was possibly why I enjoyed it so much. Served with a straw (not plastic), it was easy to sip and there was nothing ‘not to like’ about it. I was smitten, but would understand if a gin purist preferred something more traditional. It did make me a little light-headed, so when the cheese board and meat platter joined us at the unique table, I dug in. Stuart put the cheese my side, which was fortuitous as I am not a lover of meat. That was Nick’s department. The platters were darned good. I mean who couldn’t like nettle cheese? There were silverskin onions, pickle, olives, baby tomatoes, lettuce as well as a selection of cheese, biscuits, bread and meats. 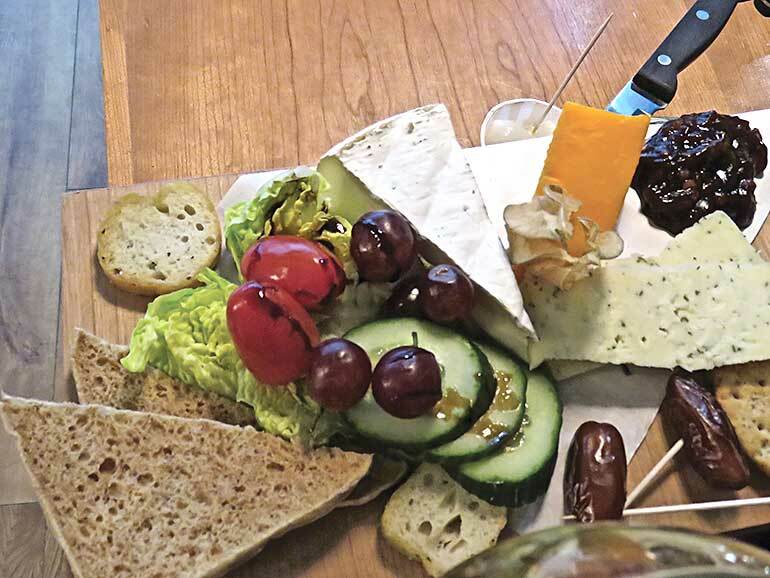 If you want a full meal, dine before you arrive and book your cheeseboard at Tin of Sardines afterwards, or book a meat platter at the gin bar as your starter, go and have your meal, then come back for the cheeseboard. These exciting possibilities will make your evening out in Poole much more interesting. Several people did exactly this while we were there. Having said that, Nick and I had not eaten an evening meal and the platters easily kept the wolf from the door. We did resort to a sandwich on the boat later that night, but if I’m brutally honest, that could have been greed. Our next gin arrived. Smoky Chilli Gin with Fever-Tree Smoky Ginger Ale, cardamom, kaffir lime leaves, chilli and cloves. I loved the ginger tones and chilli kick, but the cloves didn’t push my buttons. Surprisingly, I drank it all, so it can’t have been that bad, or maybe I was becoming less fussy as the night wore on. Trevor kept me spellbound as he elaborated about the gins. When he told me about Monkey 47, I had to ask him to repeat himself several times. At 47% and containing rare botanicals, a neat glass will set you back between £65 to £110 depending on which ‘cut’ you purchase. 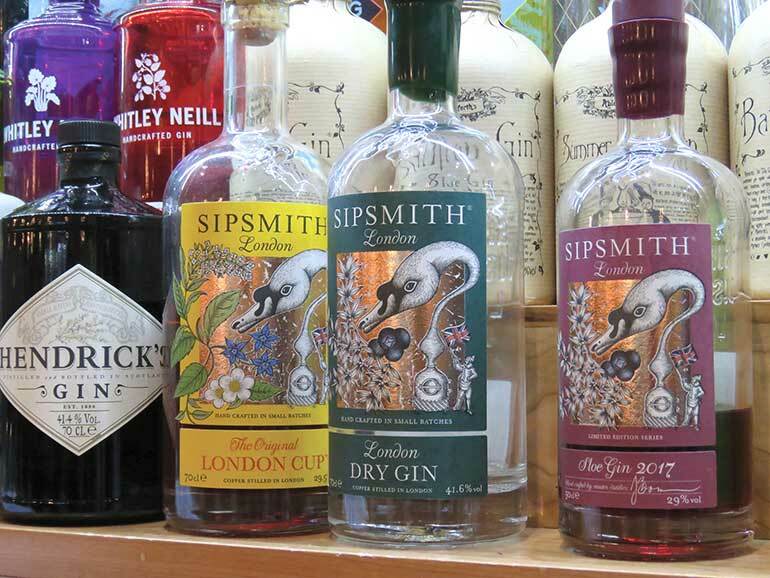 A gin with many facets, it is one to seek out if you haven’t tasted it already. But £110? I can only hazard a guess at which footballer will buy that one. I wouldn’t turn it down if it was offered, but it would probably overwhelm me with its flavours. Yet, in my own small way, I was beginning to understand what gin drinkers look for. Our third gin was more straightforward. Boodles Mulberry Gin with Fever- Tree Mediterranean Tonic. A pink gin, it had a warming flavour and with fruity notes, which clearly are the ones I enjoy most. I don’t think I am a juniper woman, but I would class myself as a gin convert now because I have learnt that there are gins out there to suit most tastes. If you were really adventurous, you could work your way right through Trevor and Ben’s gin menu, but with over 250 recipes, it will take a lot of visits to sample the entire collection starting with 3 Pugs Bubblegum garnished with strawberry and cherry, and ending with Zymurgorium Turkish Delight with ginger and rose petals. Also available at Tin of Sardines are beers, whiskys, rums, vodkas, tequilas and wines. And if you’re driving, there are plenty of soft drinks available, or you could bring a yacht to sleep on! Tin of Sardines opens Sunday to Thursday, 10am to midnight and Friday and Saturday, 10am to 1am, so you can also be sure of a great cup of coffee or tea and a tempting pastry or cake, and if you’re over 60 and get there between 10am and 11am on Thursdays, your cuppa is free! Tin of Sardines offers a great evening out and there is no doubt that if you try, and try and try a gin, you will definitely find a flavour that you love. I did and it was a great revelation. The bar is small, seating around 20 people and with standing room for 20 or so more. Booking is strongly advised at weekends.